Ages 4 through 8. Teach young children with communication disorders and other disabilities the skills that they need to interact effectively with others in social contexts. The stories target specific skills such as taking turns, requesting assistance, and saying "thank you," The activities help children to distinguish socially appropriate behaviors from behaviors that are socially inappropriate. 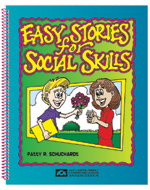 This book will be especially valuable in programs for children who have difficulty with the pragmatic aspects of communication. Sequencing stories are included to build oral expression, verbal reasoning, and verbal sequencing of information. Students are asked to evaluate the appropriateness of specific social behaviors and to react to situations presented in short stories.